What’s the #1 thing most bloggers struggle with? You’re 100% right if you said “coming up with blog post ideas“. Believe me, it is still one of the things that take a lot of time for me. Nevertheless to say coming up with traffic generating blog post topics is REALLY hard. If you’re also like me, you will find this post really interesting and informative. 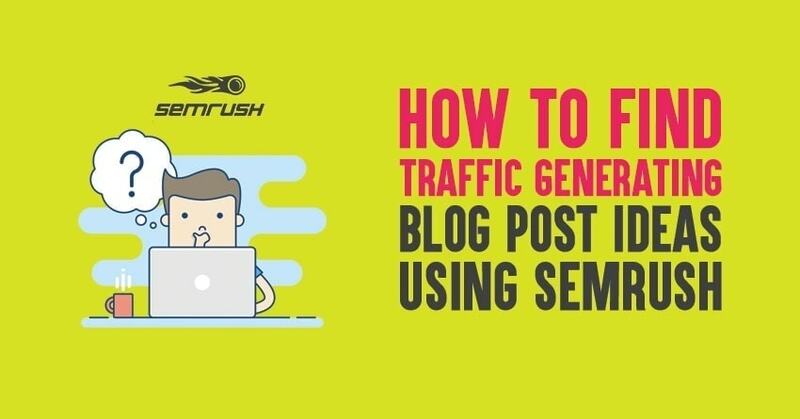 In this post, we will talk about how you can use SEMrush to find high traffic generating blog post (Content) ideas really quickly. Are you curious to find out more? Let’s get started without much ado. Quick Note: For this tutorial, we are using SEMrush. Make sure to grab its 14 days free trial (worth $47) to get the most out of this tutorial to find blog post ideas that increase your search traffic and sales. You need to find out your current keyword rankings (you must know where you currently stand) in Google search before starting your journey to finding high traffic generating blog post topics with SEMrush. Although there are a lot of tools out there to know your current keyword rankings, SEMrush gives you accurate results. Once you’re on SEMrush dashboard, just enter your website into SEMrush’s search bar and then click search. Now click either the big blue number under Organic Search or use the left-hand sidebar to click on “Organic Research”. Here’s how it looks like. This will show you all of the keywords your website is currently ranking for within SEMrush, using the Organic Positions Report. Based on the keywords, it tells you where you are currently ranking. In the above screenshot, you can see the position you are ranking for your keywords, analytical data including search volume, traffic %, cost %, competition level and much more. So, you know where you stand, and now take a look at what your competitors are ranking for. Enter your competitor into the search bar at the top and go to the same report to see this data. If you don’t know who your content website’s competitors are, then go to the Organic Research Competitors report and it will tell you based on commonly ranking keywords, who you should consider as a competitor. Once you find out your competitor, then go to that domain’s Organic Positions report. Here you can see what their top performing keywords are. You can even see what keywords are driving the most traffic to their website by sorting this by Traffic %. Do any of these keywords relate to your website? And, check for the keywords listed in this report that you are not currently ranking for. Find a keyword that best fits your website. Click the keyword to be taken to the Keyword Overview report. It will tell you everything you need to know about the keyword including average monthly search volume, number of results that show up for the keyword. So, you have narrowed your results down to a particular keyword, now you can try to break it down further. Phrase Match and Related Keywords reports helps you further in finding more specific ideas. Related Keywords report gives related keywords to the keyword you searched. It also displays keywords that are lower in search volume and that fit more in your target range. To find longer tailed keywords, you can use the Phrase Match report. It will give you easier keywords to rank for and might even give you a more specific idea for a blog post. By knowing your competitors’ high traffic generating keywords, you can increase search engine traffic to your blog than your competitors and can make great content around those keywords. Enter any seed keyword related to your niche into the SEMrush search box. Here I enter, “SEO tips”. In the above screenshot, you can see an overview of this keyword. It provides the trending data for this keyword, the organic and paid search opportunities, as well as phrase match and related keywords data. You can take a look at full report for a deeper dive into it. In full report, you can identify relevant and important keywords that have search volumes. One way to do keyword research is targeting a keyword with search volumes. With the Phrase Match Report, you can find out the Keyword Difficulty, the suggested CPC (in USD), the Competitive Density (PPC), the number of Results (in Google), the Trend for this particular keyword. Remember, doing keyword research is all about looking at the search volume and the keyword difficulty for a particular phrase. If you find no search volume for any particular keyword, then try targeting multiple phrases in one article. In the trial period, SEMrush will only give you some amount of keyword ideas. SEMrush helps you to find new content ideas and also rank highly in the SERPs. Here are the few things you need to do for this. Choose your competitor: Make a list of all the top blogs in your niche in a spreadsheet. Now enter each one in SEMrush search bar. Head over to the left hand navigation and choose “Organic Research” from the “Domain Analytics” dropdown. Apply filters: To analyze your competitor’s data, you need to apply filter. After applying filter, you can now see all the ranking keywords of your competitor. From each filter, you can understand each keyword phrase and how realistic your chances of ranking for it. Sort it: Usually, SEMrush sort the results by traffic that displays branded terms at the top. Look at SEMrush’s Keyword Difficulty, if you are not seeing any results, then increase to <90. Spot the opportunity: Find out a long tail query that is ranking on the first page and has more searches per month. So, now you have identified a query. Try these three to make sure that you are step ahead of your competitor. Create valuable and relevant content. Keep metadata and page titles relevant to the search query. When you turn that common issues to blog post topics providing solutions, it will not only help readers but also increases authority of your blog. For a blogger, the SEO Ideas tool is an extremely powerful tool. You may have one target keyword for your page but you are not sure what context to use with it. This is exactly what the SEO Ideas tool does for you. The SEO Ideas tool will give you related words to include in your content based on who is ranking for the keyword you are targeting based on your Position Tracking and Site Audit data. It offers a complete and structured list of things you could do to improve your rankings for certain pages of your website. It provides you a well-defined actionable plan on how to improve your page’s rankings for the Google- top-10 keywords you specify. SEO Ideas tool automatically offers practical suggestions by utilizing SEO tactics from your competitors and analytical research data from SEMrush. Check out the Detailed Analysis report, if you wish to do your own research based on the automatically gathered data. This report will provide you with all information for a selected landing page by comparing the page with results collected from your top-10-ranking competitors. You will get a list of semantically related keywords to include in your content. You can connect Google Analytics to generate ideas to improve the user experience of your pages. With SEMrush SEO Ideas tool, you will also know where you should include your targeted keywords in your content. Well, you may be wondering how to use SEMrush to get content ideas. Here I discuss for an ecommerce website. Okay, let’s start with the keyword phrase, “wireless earbuds”. By taking this example keyword phrase and digging deeper using SEMrush, you can find even more content ideas for an ecommerce website. Enter “wireless earbuds” into a SEMrush search bar. You can see a lot of data for this keyword. Let’s see more into Organic search results like who is showing up in the organic search results for clothing and accessories. Dig a little deeper to find some content ideas. Looking at “phrase match report” and the “related keywords report.”, you can immediately come up with a list of keywords. Using the SEMrush data, it’s really easy to see both the “phrase match” keywords and the “related keywords” right next to each other. And, it turns out that the “related keywords” really bring in much more potential traffic than the “phrase match” keywords. SEMrush helps you to know the most profitable ads and keywords that your competitors are running. You can spy on the exact keywords that your competitors are bidding on as well as the exact ads that they are currently running. You can also find out the “Ads History” for the keywords that your competitors are bidding on. If a competitor is bidding for a particular keyword for several months, that means it’s a profitable keyword for them. You can track the keyword position of your competitor in any search engine based on their geographical location. SEMrush helps you to discover all keywords your competitor is currently ranking for, on any given page. I wrote an in-depth guide on using SEMrush for competitor research where you will find all the interesting information about using SEMrush to spy on your competitor’s top keywords and crush them in search traffic. No doubt, SEMrush is the best SEO tool that will help in increasing your organic traffic by spying on your competitor’s top ranking keywords. If you are having hard time in coming up with profitable blog post ideas, SEMrush comes into handy. It’s one of my favorite SEO tools that’s helpful for doing many things ranging from keyword research to competitor analysis to SEO audits. Rather than using your own imagination to come up with random topic ideas for your blog, focus on finding the RIGHT topics so you can bring more search traffic. Here’s where SEMrush can be so much useful as it gives a lot of details such as traffic volume, keyword difficulty, related keyword ideas etc. Make sure to grab SEMrush 14 days free trial so you can get ahead of SEO game. So what are your thoughts? Did you find this post on using SEMrush to find blog post ideas useful? Do you have any questions? Share your views in the comments below. I used Semrush it is awesome software for audit our website. Shailesh, please use https://bloggerspassion.com/recommended/semrush link to try SEMrush Pro version worth $47 for free for the next 14 days. Please let me know in case you have any additional question about SEMrush for me. To find more content marketing ideas and to find more ideas that you could write about on your website’s blog, for example, the next step would be to take those competitors and dig deeper using SEMrush. At Present Iam Fresher.I dont have much knowledge of seo tools.But mostly I use SEMRUSH Tool.Thank You For Sharing Such Valuable Information which is helpful for my future. keep track of competator using semrush is good idea .thanks for the post. There any other tools other than semrush? Nice post Anil. Spying on a competitor is the best idea for someone who is looking for quick tips on the idea. But still, you have to decide per the competition, cost, etc. There is no point in going after some keyword whose competition is high. SEMRUSH is a great tool in terms of keyword research. I would also suggest long tail pro for looking for more targeted keyword research ideas. I see, this is the post which became the top article of SEMrush monthly contest! There’s no need to praise about SEMrush because it’s boss in the field of search engine marketing. I wanna praise your content now. SEMrush didn’t make any mistake by choosing your post as the winner.